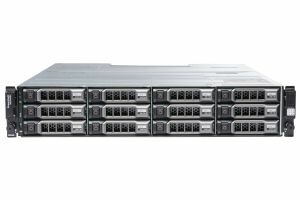 The Dell PowerVault MD3600i array is a 10G Ethernet iSCSI SAN solution that is ideal for entry-level storage consolidation in virtualized environments that require high availability and high performance without sacrificing ease of use. Supporting 12 x 3.5" SAS/Near-line SAS/SSD drives, the MD3600i can be expanded to a base of 120 hard drives with an optional Premium Feature Key and up to 192 drives using MD1200 and/or MD1220 expansion enclosures. It supports up to 4 servers directly connected or up to 64 servers when configured with Ethernet switches. As with all our used Dell SANs, our refurbished MD3600i can be configured to your specific requirements.